Our goal is to provide experiential learning opportunities and cultural expansion for physical therapists and physical therapy students while allowing those in our partner communities to benefit from assessment and physical therapy. Our physical therapy program provides evaluations and services during home visits and within health care facilities and community clinics, assessing patient needs, providing relief from pain, and offering education and insight. Physical therapy volunteers are able to receive an invaluable opportunity to not only observe physical therapist in action, but to actively assist with important aspects of physical therapy treatment. Who Is Right For Our Physical Therapy Program? ISL’s physical therapy program is ideal for physical therapists, physical therapy students at all education levels, and students and professionals in massage therapy and sports medicine. Note: Costa Rica physical therapy volunteers must have completed a basic course in anatomy and physiology. The Dominican Republic is only available to licensed physical therapists and DPT students accompanied by faculty. Upon arrival in-country, you will be met at the airport by ISL staff. Your team’s first day will be busy with orientation and intensive training seminars on orthopedic massage for shoulders, neck, knees, elbows, hips, and legs, and the assessment and treatment of soft tissue injuries, as well as patient intake and learning medical terminology (Spanish or Swahili); then the community work begins! In the evenings, you will participate in seminars on PT issues. There will also be designated time for group reflection – time to discuss and express what you’ve experienced in your day’s community work, either formally or informally. ISL collaborates with in-country professionals and local Ministries of Health in order to determine how our volunteers can best impact developing communities. Level of volunteer participation is directly dependent on level of training. For example, each team has the potential for three levels of volunteer involvement: observer, assistant, and practitioner. Pre-PT student volunteers would fall into the “observer” category in terms of the examination/diagnosis/treatment process, but would be allowed hands on experience with non-invasive procedures such as taking vitals, as determined by local Ministry of Health standards, while a PT student might assist in the examination, diagnosis, and treatment process to the degree determined appropriate by local Ministry of Health standards. The goal of ISL's physical therapy program is to learn about local physical therapy challenges, provide PT evaluations and services, experience Belizean culture, and gain perspective on the global landscape. This program is combined with a Global Heath program allowing for collaboration in the community clinic setting. Minimum of 2 volunteer required. This program is suitable PT students and professionals. The goal of ISL's physical therapy program is to learn about local physical therapy challenges, provide PT evaluations and services, experience Belizean culture, and gain perspective on the global landscape. Work setting will be dependent on number of participants. 2-4 participants: Programming will take place in an ISL partner institution. 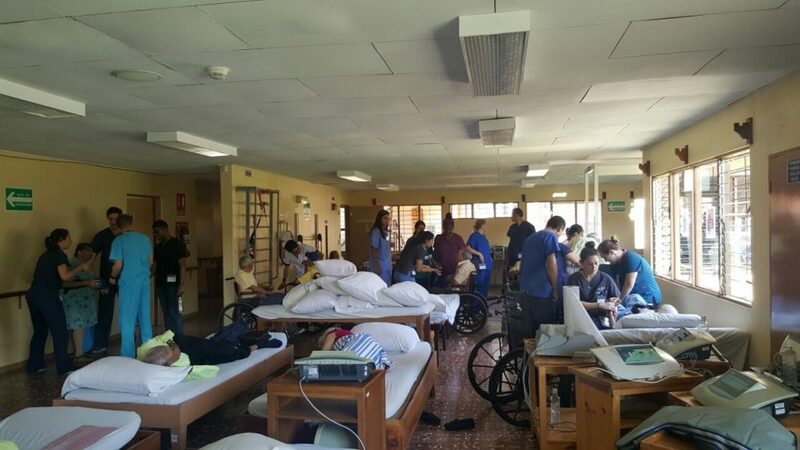 Volunteers will assist physical therapists in the provision of care. 5+ participants: Programming will take place in an ISL partner community in addition to the institutional setting. Volunteers will participate in public health surveying and the provision of physical therapy, including orthopedic massage, and soft tissue assessment. PT Continuing Education Credits available. This program is suitable PT students and professionals, as well as pre-PT students who have completed Anatomy & Physiology. The goal of ISL's physical therapy program is to learn about local physical therapy challenges, provide PT evaluations and services, experience Mexican culture, and gain perspective on the global landscape. Work setting will be dependent on number of participants. 1-5 participants: Programming will take place in an ISL partner institution. Volunteers will assist physical therapists in the provision of care. 6+ participants: Programming will take place in an ISL partner community in addition to the institutional setting. Volunteers will participate in public health surveying and the provision of physical therapy, including orthopedic massage, and soft tissue assessment. Continuing Education Credits available for licensed PTs. Open to 1-14 volunteers. This program is suitable for PT students and professionals. The goal of ISL's physical therapy program is to learn about local physical therapy challenges, provide PT evaluations and services, experience Costa Rican culture, and gain perspective on the global landscape. Programming will take place in an ISL partner community in addition to the institutional setting. Volunteers will participate in public health surveying and the provision of physical therapy, including orthopedic massage, and soft tissue assessment. PT Continuing Education Credits available.